We have >250 days with sunshine every year. In the dry months from April through November the weather is gorgeous. We get most of our 10-12" of annual precipitation in the winter. The tree in our front yard is a 95' tall ponderosa pine. Bend is one of the fastest growing cities in the US. 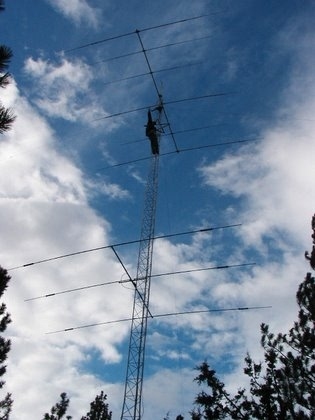 I am into ham radio. DX chasing, contesting, and making friends on the air. This has been my passion since age 13 back in 1960. I am president of the Central Oregon DX Club. As an RF engineer I made big RF power transistors and design HF power amplifier application circuits to show how they can be used. Solid state broad-band amplifiers using transistors like these will gradually obsolete the manually-tuned tube amplifiers that currently dominate the amateur market. I retired in October 2014. 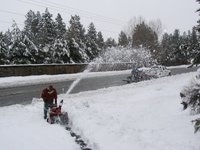 My wife and I are into gardening but there is competition here in Bend. A new crop of mule deer shows up every June. We don't grow flowers, we grow "deer salad". These fauns are sampling our wares and taking a drink from the bird bath about 30' from our back door. Deer-resistant gardening is an art. Look carefully and you can see foxglove and two varieties of thistle.